We found out Australian schools have four sessions a year with long breaks between them, but no three-month summer vacation as in the US. So in the summer months of February and March in New South Wales and Queensland, beaches are filled with groups of schoolkids. They’re here for PE class to learn surfing. It starts when the kids are very young. We saw some that looked about three or four years old. It must be like learning to ride a bike or speak a language. Start early for lifelong proficiency. 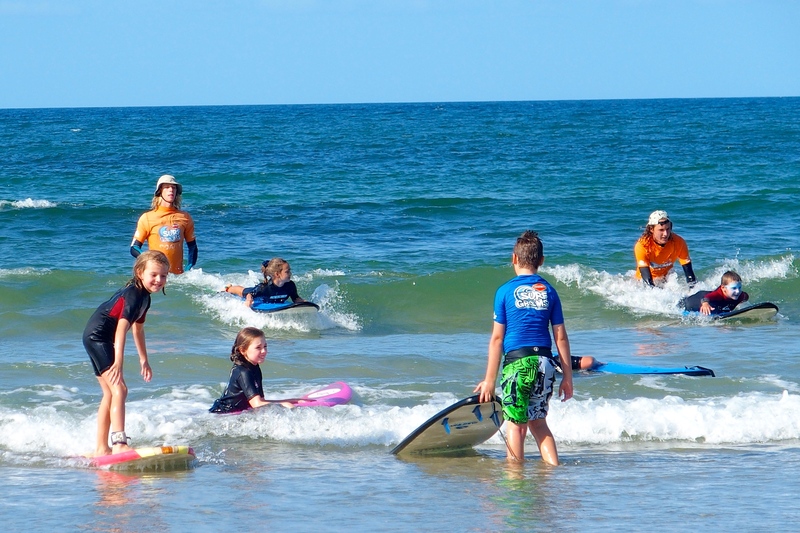 The two adults in orange are pullers and pushers, helping the kids paddle out through the surf and catch a wave back to shore in a foot or so of water. Success! He’s got the form down. Another group of high school kids showed up in a bus. They spent about 45 minutes on the waves and then their teacher whistled them in. They probably had to go back for geometry class. 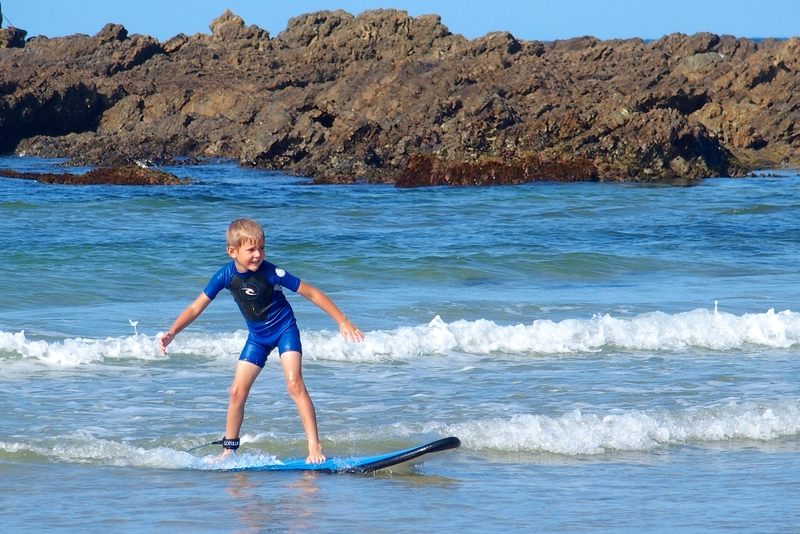 At some point the kids are able to master the waves on their own. Then they throw their boards on top of their trucks and drive along the shore looking for the best spot for an hour or two of after-school fun. Eastern Australia has thousands of miles of shore with breaking waves. So hard to choose where to put your board in. We arrived at Snapper Rocks a few days before the Quiksilver and Roxy Pro Surfing competition. Local amateurs were enjoying the great waves and some of the pros were getting in some practice. Kelly Slater was out on the waves the day we watched. A little crowded? Probably more than 40 surfers in this cove. Who has right of way? 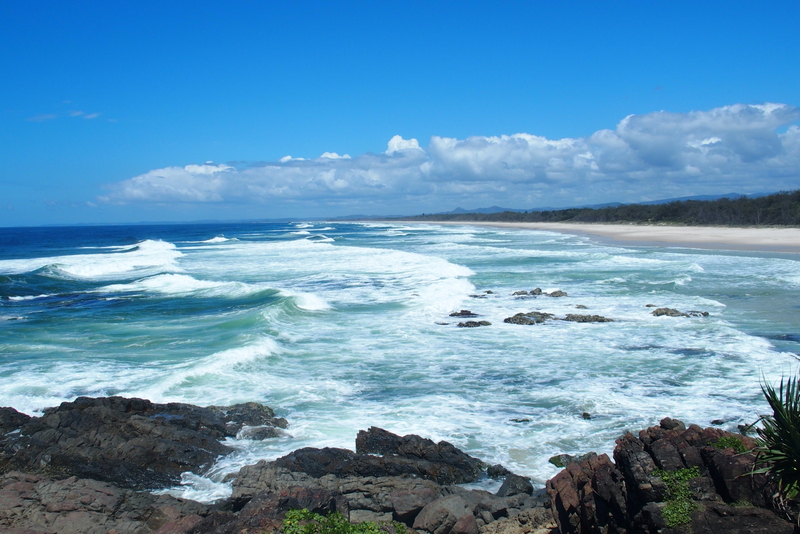 This is the southern end of the Gold Coast, famous for surfing. Some might call this a surfer’s paradise. 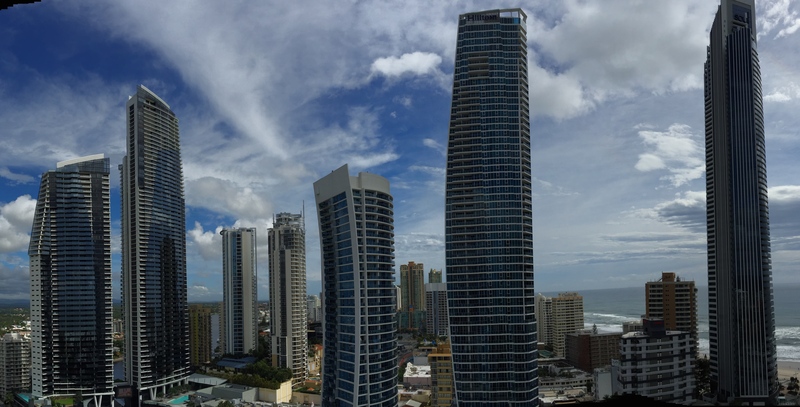 In fact, the skyline in the back of the photo above is a town named Surfers Paradise. The town was originally named Elston, not exactly inspiring. In 1925, Surfer’s Paradise Hotel was built. That was such a good name that the city followed suit and officially changed its name as well. Good marketing! The rest is history. High-rises have sprung up and the city now looks like Miami. We imagine a lot of Chinese investors are gobbling up apartments here. 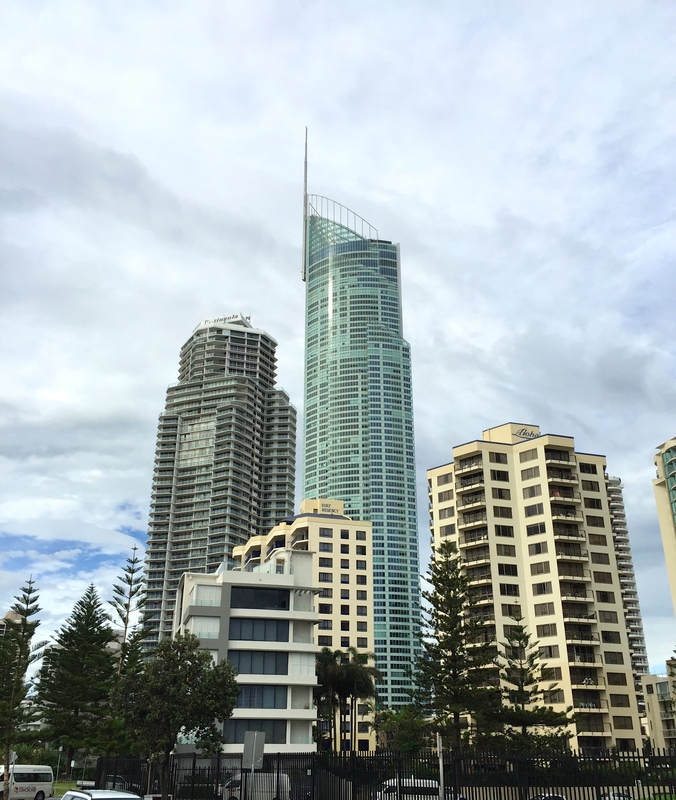 Q1, the tallest building in Australia, has plenty of room for surfers on its 78 floors. 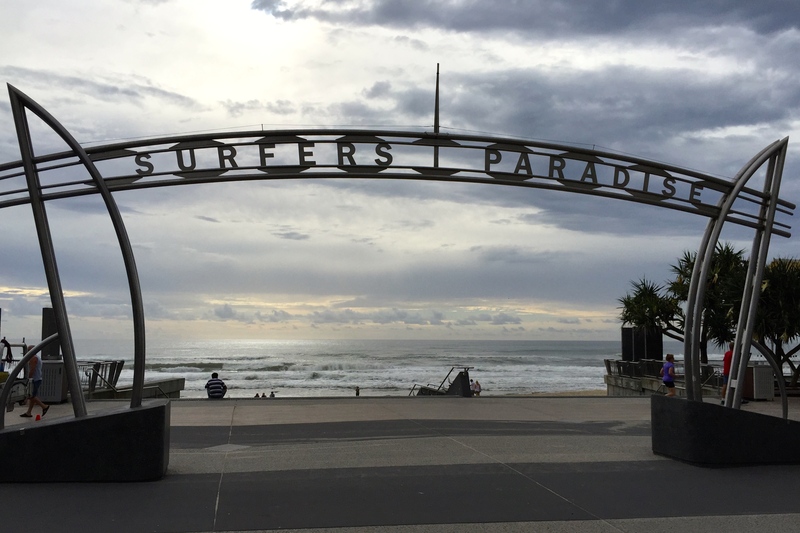 This entry was posted in Smell the Roses, Travel Journal and tagged Australia, Gold Coast, Surfers Paradise, surfing. Bookmark the permalink.